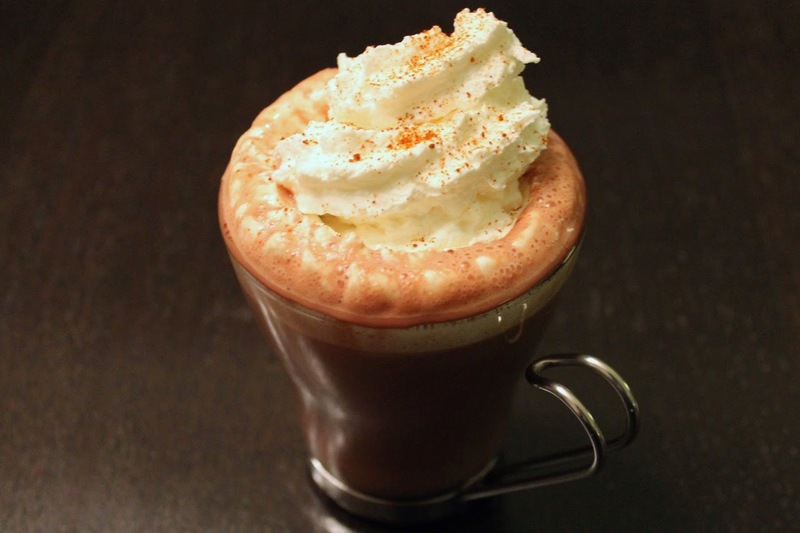 Looking for an interesting winter warmer, I came across this Spicy Aztec Hot Chocolate on Serious Eats. The drink warms you up on multiple fronts, being both hot and spicy with chile flavors. The original recipe called for using a dried ancho chile pepper. Instead, I used Bittermens' Xocolatl Mole Bitters and Hellfire Habanero Shrub. Mole bitters seemed like a natural fit for a Mexican hot chocolate-inspired cocktail, since mole contains both chocolate and chiles. And the habanero adds a nice fiery kick. Using bitters also allows you to adjust the heat to your liking. 1. Combine cocoa powder, sugar, salt, milk, cinnamon stick, chocolate chips and bitters in a saucepan. Heat over medium heat, stirring frequently until the chocolate has melted and the mixture is hot. Stir in the mezcal and cook for another minute or two until the mixture is hot. (Alternatively, Combine the first eight ingredients--through the bitters--in a microwave safe container and heat at 50 percent power in 1 minute increments, stirring between heatings, until the chocolate has melted and the mixture is hot. Then add the mezcal and heat for 1 more minute on 50 percent power). Remove the cinnamon stick. 2. Blend the mixture with an immersion blender until frothy (or transfer to a blender and blend until frothy). 3. Divide the mixture between two glasses. Top with whipped cream and a sprinkle of ancho chili powder.